South Korean automakers Hyundai Motor and Kia Motors rose nearly 3 percent early on Monday amid prospects of customer gains as Hyundai offered incentives for U.S. customers trading in Toyota (7203.T) vehicles. Popular, low-cost models and savvy marketing helped Hyundai grab market share in the United States and China last year and analysts are optimistic the firm would win more and keep its edge over rivals this year, as Toyota is mired in its largest ever recall, analysts said. "Recent negative newsflows on Toyota point to an opportunity for Hyundai Motor to increase their market share overseas," said Kong Jeong-ho, an analyst at Prudential Investment & Securities. "Hyundai is set to unveil their new Tucson and Sonata model in the United States soon, and this is feeding expectations further." Toyota has issued a series of recent recalls covering 5.6 million vehicles in the United States due to sudden acceleration in some. It is the largest ever recall for Toyota and among the biggest for an automaker in U.S. history. 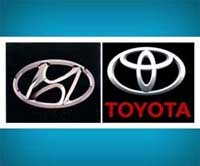 Hyundai, which aims to boost its U.S. market share to 4.6 percent this year from last year's 4.2 percent, said its new Toyota-targeted incentive programme started on Thursday and would cover 2009-2010 model-year Sonata, Elantra and Elantra Touring models, with no closing timeframe set. Hyundai is set to report January sales data at around 0400 GMT, which some analysts expect to be very strong at about 120,000 vehicles, as an economic recovery and new models bolster demand. Hyundai posted a record quarterly operating profit last week as its small cars proved popular with recession-weary buyers and plans to raise sales this year by 11 percent to 3.46 million cars, trucks and buses.